Pete Spyke shows a 5-year-old Tango on Cleo in Citra. The tree has never received foliar spray, and HLB is present in the grove. Editor’s note: Look for part 2 of this article in the May 2017 issue of Citrus Industry magazine. Part 2 will present case studies using controlled-release fertilizer. Until now, most growers have considered controlled-release fertilizer (CRF) to be primarily for use on young trees, especially resets in existing groves. 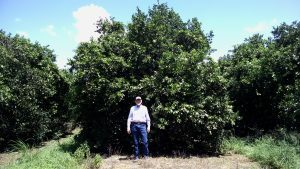 There is increasing evidence, however, that CRF can also help mature trees of certain varieties overcome the effects of HLB. Consequently, growers are modifying their dry fertilizer programs to include CRF, at a cost per acre that’s equivalent to a program using only conventional, ground-applied, fertilizer-source materials. In limited field trials and greenhouse studies involving a number of variety and rootstock combinations, the use of ground-applied, polymer-coated CRF with elevated levels of minor elements has resulted in trees with reduced symptoms of HLB that are producing good crops of wholesome fruit. This outcome appears to be consistent over different growing conditions and multiple years. Furthermore, field observations indicate that mature trees can recover from HLB infection with only applications of CRF. The extent and progression of recovery is dependent on the prior health and variety/rootstock of the trees. The CRF materials are formulated by coating granules of fertilizer with a polymer that breaks down in a timed-release, temperature-dependent schedule from rainfall or irrigation, thereby supplying the nutrients gradually. For mature groves, the most cost-effective practice is to blend CRF with conventional source materials to provide both immediate availability and extended release. CRF source materials are more expensive than conventional materials, but the total amount of nutrients applied can be reduced due to the higher uptake efficiency. Therefore, the per-acre cost of blended nutrition programs, or “hybrid” programs, is equivalent or only slightly higher compared with exclusive use of conventional sources. We have seen that when transitioning commercial blocks to CRF with limited foliar spray applications, production is increasing, fruit quality is improving and the production costs can be returned to less than $1,000 per acre. Clearly, there’s a lot to learn about the role of CRF and minor elements. However, there is a growing body of observations that for certain varieties, CRF “hybrid” programs work as well as or better than a program based on conventional dry or liquid fertilizer with foliar nutrition supplements. CRF “hybrid” programs also can be a lot less expensive than a program based on intensive foliar spray applications associated with aggressive psyllid control and foliar nutrition. Why is CRF more effective than conventional, ground-applied fertilizer or fertigation? Most commercial groves have been receiving ground applications of conventional fertilizer every year since HLB was discovered. In almost all cases, production has declined as the trees are affected by the infection of the bacterium, Candidatus Liberibacter asiaticus (CLas). In some cases, the effects of HLB have been mitigated with foliar sprays to supply nutrients along with frequent fertigation applications. However, the foliar sprays are expensive to apply, and absorbing nutrients through the waxy cuticles of leaves is not the most efficient way to supply nutrients. Frequent fertigation requires an investment in irrigation system control and more intensive management, which adds cost. For fertigation programs, most of the systems are being operated much more often than would be required for irrigation alone, so if water quality — such as bicarbonate level — is an issue, additional costs and management are necessary to deal with those problems. This 25-year-old Navel on Sour Orange grows in a Weirsdale commercial grove. According to Pete Spyke (pictured), it receives one postbloom fruit drop spray and one summer spray only. Trees absorb nutrients rapidly when they are applied to the soil in liquid or conventional dry sources go into solution. David Calvert [University of Florida/Institute of Food and Agricultural Sciences (UF/IFAS) professor emeritus] showed that up to 50 percent of available soluble nutrients are absorbed within 24 hours, with most of the rest following shortly thereafter. Robert Koo and C. A. Anderson (UF/IFAS professors emeritus, deceased) showed that in Ridge soils, there was no statistical difference in yield when conventional fertilizer was applied one, two or three times per year. Since soluble nutrients in most dry fertilizer are obviously not stored in sandy soil for a year, the conclusion is that healthy trees can take up the fertilizer, store the nutrients and then redistribute them internally as growing conditions demand. When a tree is infected with CLas, however, leaf analysis often shows adequate levels of nutrients in mature leaves, but new leaf flush growth shows deficiencies. Since some of those deficiencies are associated with nutrients that move easily from one place to another in the plant, HLB must interfere with the uptake and transport of these nutrients to young growth and fruit. That would apparently explain why foliar nutrition produces a positive response; it’s helping overcome compromised nutrient uptake and mobility within the tree. But foliar nutrition apparently isn’t supplying adequate nutrition to the roots, because movement of nutrients and carbohydrates downward and outward to new leaves is limited by the HLB-induced blockage in the phloem of the tree. And, foliar nutrition isn’t a very efficient way to supply macronutrients, such as nitrogen or potassium, to trees in the quantities required for optimal tree growth. Limited new data comparing healthy and HLB-infected trees shows that deficiencies of micronutrients are much greater in roots than in leaves of infected trees. In addition to feeder root loss, HLB also seems to compromise the ability of the remaining roots to mine and translocate nutrients to the top of the tree. A constant supply of the deficient nutrients in the root zone seems to help compensate for this reduced uptake and translocation efficiency in HLB-impacted roots. Since CRF material is not all immediately soluble, less is lost to leaching or volatilization, and it essentially creates a reservoir in the soil available to the trees over time instead of all at once. Nutrient release from CRF is activated by water, so every time it rains or microsprinkler irrigation is applied, the roots take up water that contains small amounts of fertilizer into the xylem. Since the xylem connects all parts of the tree, water is transported directly to all growing points, which means they’re also supplied with fertilizer. Water and nutrient uptake by the roots and transported in the xylem is the natural way of supplying the tree, so it’s more efficient than trying to drive nutrients into the leaves through the waxy cuticles with foliar sprays. An optimum pH for nutrient solubility and uptake should also be considered. The primary reason why acidification of high-pH, high-bicarbonate well water or various sulfate treatments to lower high-pH soil improves HLB-infected tree health (work by Jim Graham at the Citrus Research and Education Center and Kelly Morgan at the Southwest Florida Research and Education Center) is because of improved nutrient uptake and translocation. Liquid fertilizer is inexpensive, so why not just rely on frequent fertigation with drip or microsprinklers? For larger growers, it’s true that the source materials for fertigation are the least expensive, but there is also a cost to applying them. CRF materials are the most effective in the summer rainy season, which is also when it’s usually not necessary to irrigate; so they may be a good complement to a liquid program. The dry applications of CRF also can cover a larger portion of the root system than just the irrigated wetted area, which may be another reason why they’re more effective than liquid. For many growers, especially those with smaller groves, a CRF/dry program is the easiest program to implement. The material can be applied in as few as two applications per year, the cost per acre doesn’t have to be any more expensive than conventional dry programs, and it is simple to apply. If irrigation systems are capable, fertigation may be helpful during the spring dry season, even when primarily relying on a CRF program for nutrition. Since part of the nutrients are coated, and water is the primary factor in degradation of the coating, material outside the wetted area is stable and will be available when rains resume. Clearly, there’s a lot to learn about the role of CRF and minor elements, but observations indicate that it can work as well as or better than a program based on conventional dry or liquid fertilizer with foliar nutrition supplement. And, CRF can be a lot less expensive. As research continues, there may be other positive benefits identified from using “hybrid” CRF programs, such as a more synchronized bloom and reduction of postbloom fruit drop via less inoculum buildup, reduced need for psyllid control and higher fresh-fruit packouts. Is overdosing citrus trees with minor elements beneficial? Most commercial, dry-fertilizer formulations contain only relatively small amounts of the micronutrients manganese, zinc, boron and iron. Jude Grosser, UF/IFAS professor, performed greenhouse studies that showed root mass and HLB-infected tree growth were improved when slow-release minor elements, especially manganese, were applied at three times the normal rate. His limited field trials have shown a positive response as well. Grosser has been working with both poly-coated material and Tiger-Sul micronutrients (nutrients embedded in clay prills). There has also been a good response in field trials by Arapaho Citrus Management by simply increasing the amount of conventional, minor-element source materials such as manganese and zinc sulfate in the dry fertilizer mix. The latter are very inexpensive materials, so increasing their rate doesn’t cost very much. Acknowledgements: The authors thank Ward Gunter (ICL Group), Matt Shook and Dave Edison (Harrell’s), Brian Patterson (Florikan), Jim Chason (COMPO/Basacote) and Jack Zorn (Tiger-Sul) for their valuable ideas and product donations. 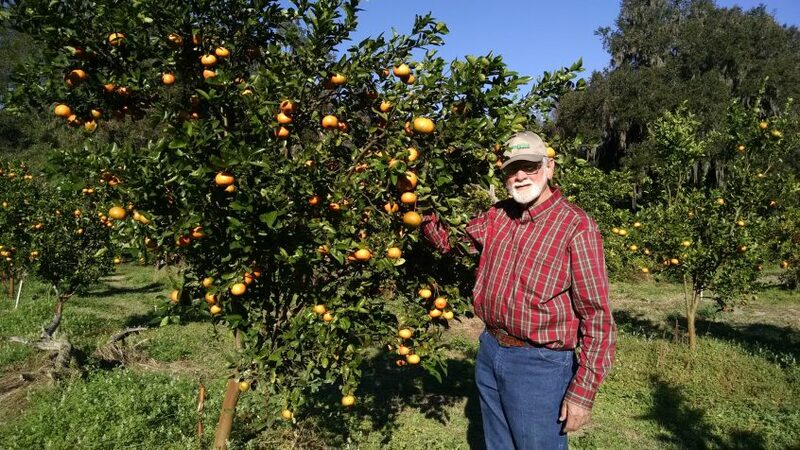 Pete Spyke (pdspyke@arapahocitrus.com) is a citrus grower, caretaker and gift fruit shop owner. Joby Sherrod (Joby.Sherrod@duda.com) is senior manager of agronomic services for DUDA Ranches. Jude Grosser (jgrosser@ufl.edu) is a research professor at the University of Florida/Institute of Food and Agricultural Sciences Citrus Research and Education Center.